Contact Gator l Schedule An Appointment l S&B motorized ? Whether you select our premium Wood Plantation Shutter, Composite Wood Plantation Shutter, Alu Core Poly Plantation Shutter or Interior Vinyl Shutter, our horizontal Wood blind, Faux Wood Blind or our fabric shade, Solar screens, Duette or Sheers all orders are custom made. Free professional measuring of your windows and fully guarantee the best results, so you can buy with confidence! Our mobile shopping experience brings the showroom of window coverings directly to your living room. Product design is our specialty, knowing the right product for your project that's what separates us from our competition. Our window treatment products like interior plantation window shutters, wood blinds, faux wood blinds, fabric shades, Roller shades, honeycomb shades, roman shades and motorized shades, Gator Blinds Shutter, Blinds, Shades and motorized Draperies is your source for any window treatment you desire. Blinds Special in December ! Window Shutter & Blinds Make The Difference! 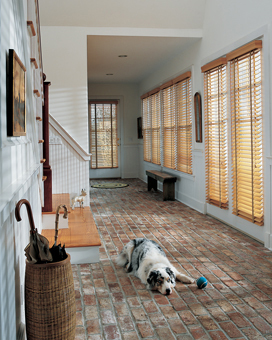 Providing premium window treatments from Hunter Douglas including plantation shutter, wood blinds, Silhouette, Duette & more!